in the course of the import of the goods into, or export of the goods out of, the territory of India. A sale or purchase of goods shall be deemed to take place in the course of the export of the goods out of the territory of India only if the sale or purchase either occasions such export or is effected by a transfer of documents of title to the goods after the goods have crossed the customs frontiers of India. A sale or purchase of goods shall be deemed to take place in the course of the import of the goods into the territory of India only if the sale or purchase either occasions such import or is effected by a transfer of documents of title to the goods before the goods have crossed the customs frontiers of India. Notwithstanding anything contained in sub-section (1), the last sale or purchase of any goods preceding the sale or purchase occasioning the export of those goods out of the territory of India shall also be deemed to be in the course of such export, if such last sale or purchase took place after, and was for the purpose of complying with, the agreement or order for or in relation to such export. The provisions of sub-section (3) shall not apply to any sale or purchase of goods unless the dealer selling the goods furnishes to the prescribed authority in the prescribed manner a declaration duly filed and signed by the exporter to whom the goods are sold in a prescribed form obtained from the prescribed authority. Notwithstanding anything contained in sub-section (1), if any designated carrier purchases Aviation Turbine Fuel for the purpose of its international flight, such purchase shall be deemed to take place in the course of the export of goods out of the territory of India. Explanation.-For the purpose of this sub-section, 'designated Indian carrier' means any carrier which the Central Government may, by notification in the Official Gazette, specify in this behalf. Sub-section (1) of section 5 of the Act defines sale or purchase in the course of export of goods out of territory of India. This sub-section covers sales in the there is privity of contract in between selling dealer and foreign buyer of goods. Sub-section (2) of the said section defines when a sale or purchase shall be deemed in the course of import of goods into the territory of India. Earlier to amendment in section 5 with effect from April 01, 1976, there had been only two sub-sections in the section. In many cases, it was found that Indian suppliers after entering into contract of sale with foreign buyers had placed orders with Indian manufacturers or traders for supply of goods for fulfilling their contract with foreign buyers. Such Indian purchasers had assured Indian manufacturers or suppliers that sale of goods, in their hands, will also be sale in the course of export of the goods and will enjoy exemption from tax. But in the Case of Shirajuddin vs. State of Orrissa (STC 1975), the Supreme Court of India laid down the principle that sub-section (1) of section 5 of the Act covers only those sales in which the privity of contract exists in between Indian exporter and foreign buyer. Thus, for the purpose of sales tax, only direct export sales were found covered under export sales. But this was not good for promotion of export. For promotion of export, it was found necessary to extend scope of definition of sale in the course of export. This was why the Parliament, in April 1976, enacted sub-section (3) of section 5 of the Act. I would like to point out here that section 5 of the Act does not grant exemption from payement of tax on sale or purchase in the course of export of the goods out of or in the course of import of the goods into, the territory of India. Exemption from levy of tax by the States follows from the prohibition provided in Article 286 of the Constitution. As it relates to levy of tax by the Union, for well known reasons, levy of tax has not been found desirable.The section provides principles for determining whether or not a particular sale or purchase is in the course of export or import of the goods. It should be the last sale or purchase immediately preceding the sale occasioning the export. A declaration in the prescribed form (Form H) is issued by the exporter to the dealer making sale to the exporter. A local supplier, unless the exporter who supplies goods to foreign buyer tells about the satisfaction of the aforesaid conditions, cannot ascertain that export conditions are fulfilled. It is only the exporter, making direct export, who knows or can prove that conditions have been fulfilled. But at the end of local selling dealer, for proving sale in the course of export in terms of sub-section (3) of section 5 of the Act, such local selling dealer has to prove that sale, of goods sold by him to exporter, fulfills conditions of sub-section (3) of section 5 of the Act. For this he will have to depend upon the exporter. Prior to introduction of sub-section (4) in section 5 of the Act, it had been sufficient if conditions of sub-section (3) were satisfied by producing copy of export order, purchase order placed by the exporter, sale invoice issued by the local selling dealer and copy of bill of lading or airway bill. But after introduction of sub-section (4) in section 5 of the Act, all such evidences are meaningless unless declaration prescribed under sub-section (4) is furnished. Sub-section (4) speaks in clear words that provisions of sub-section (3) shall not apply in respect of any purchase or sale of goods unless the dealer selling the goods furnishes to the prescribed authority in the prescribed manner a declaration duly filed and signed by the exporter to whom the goods are sold in a prescribed form obtained from the prescribed authority. After introduction of sub-section (4) in section 5 of the Central Sales Tax Act, 1956, sub-section (3) is applicable only if compliance of sub-section (4) of section 5 has been made. Sub-section (3) of section 5 is no longer independent provision. Its applicability is subjected to sub-section (4) of the CST Act, 1956. Sub-section (4) not only applies in respect of sales referred to in sub-section (3) of section 5 but it also equally applies in respect of purchases referred to in sub-section (3) of section 5. Therefore, it is mandatory for the exporter to issue Form H to the selling dealer. Where several contracts of export of a particular goods are pending with an exporter and the exporter makes purchase of such goods even if with an intention of fulfilling such export orders, he is not under any obligation to export such goods. The exporter, without breach of any contract, can sell such goods in the local market. But where the exporter makes purchase of goods on condition of issuing Form H to the seller and later issues such Form, he creates a binding on him. In that case, he has to discharge undertakings given in Form H. If goods in respect of which Form H has been issued, are diverted in the local market or are disposed of otherwise than fulfilling the export order mentioned in Form H, then such exporter enters into breach of the contract with the selling. If we examine Form H, we find that it requires Registration Certificate Numbers of the selling dealer under the State Law and the Central Sales Tax Law. Also where goods exported are re-imported in India by the exporter, then such exporter is under an obligation to inform the assessing authority of the seller. Assessing authority of unregistered seller is not known. Before introduction of sub-section (4) in section 5 of the CST Act, 1956, circumstances have been different. Also before amendment in relevant sub-rule (10) of Rule 12 of the Central Sales Tax (Registration & Turnover) Rules, 1957, Form was meant for claiming exemption from levy of tax on inter-state sale, which in absence of application of sub-section (3) of section 5 of the CST Act, 1957 would have been an inter-state sale. After amendment, applicability of sub-section (3) of section 5 depends on furnishing of Form H by the exporter to the seller. Where sub-section (3) of section 5 is found applicable, the exemption on such sale or purchase under the State Law comes from sub-clause (b) of clause (1) of Article 286 of the Constitution. So far as it relates to levy of tax by the Central Government, tax on such sale is not leviable because no law have been enacted by the Union Parliament for imposing tax on sale or purchase taking place in the course of export of the goods out of the territory of India. Before introduction of sub-section (4) in section 5 of the CST Act, 1956, circumstances have been different. Also before amendment in relevant sub-rule (10) of Rule 12 of the Central Sales Tax (Registration & Turnover) Rules, 1957, Form was meant for claiming exemption from levy of tax on inter-state sale, which in absence of application of sub-section (3) of section 5 of the CST Act, 1957 would have been an inter-state sale. After amendment, applicability of sub-section (3) of section 5 depends on furnishing of Form H by the exporter to the selling dealer. Where sub-section (3) of section 5 is found applicable, the exemption on such sale or purchase under the State Law comes from sub-clause (b) of clause (1) of Article 286 of the Constitution. 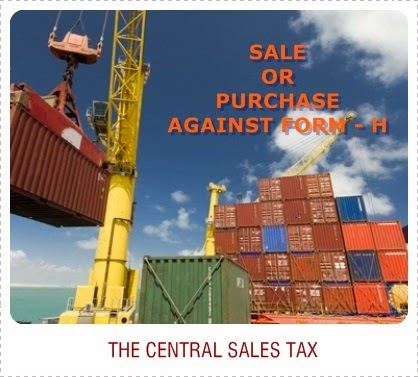 Such purchase or sale is exempt from levy of the central sales tax because the Central Sales Tax Act, 1956 does not provide for levy of tax on sale or purchase taking place in the course of export of the goods out of the territory of India. On examination of Form H, we find that it requires Registration Certificate Numbers of the selling dealer under the State Law and the Central Sales Tax Law. Also where goods exported are re-imported in India by the exporter, then such exporter is under an obligation to inform the assessing authority of the selling dealer. Assessing authority of unregistered selling dealer is not known. This implies that transaction of purchase and sale of goods should be in between a registered selling dealer and Registered exporter. As it relates to provisions of VAT Act, if export conditions are fulfilled then sale is in the course of export and State law is not applicable to local sales. These sales and purchases are protected by the provisions of the Constitution read with provisions of section 5 of the Central sales Tax Act, 1956. Hence there is no impact of commencement of VAT law in any State.